Walk among an enchanting, 50-acre field of gorgeous flowers sprinkled across The Flower Fields. Giant Ranunculus bulbs are the main draw here. From early March through early May, feast your eyes on an array of brightly colored flowers ranging from bold reds and bright oranges to vibrant yellows and deep pinks. Explore the Artists Gardens, take a peek at 1,500 square foot Poinsettia Greenhouse and learn all about the world's most famous potted plant. and find your way around the sweet pea maze. Pay a little more and take an open-air wagon ride around the fields while listening in to a narrated audio on the history of the field. Enjoy discovering edible and ornamental plants at the Demonstration Garden. Our romantic hotel has the best deals near The Flower Fields in Carlsbad, CA. When is the best time to go to the Flower Fields? To see the flowers in full bloom, the best time to go to the Flower Fields is March 1st through May 10th when it's open to the public. You'll be able to see brightly colored Giant Ranunculus among other vibrant spring flowers scattered throughout the field, within the gardens, and in the greenhouse. What is included in Guided Walking Tour? 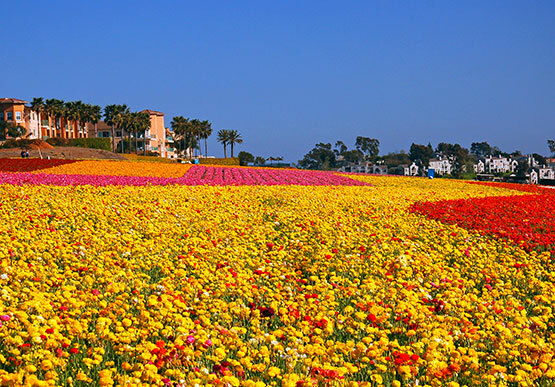 The best way to explore the Flower Fields of Carlsbad, CA is to take an informative guided walking tour. The guided walking tour includes a history lesson of the Flower Fields, learning about the planting process and growing cycle, varieties of flowers grown, a short walk up a slope at your own pace, and a chance to shop for gifts and souvenirs at the gift shop.